Tempe Copiers allows your small business or one-person home based business to reproduce professional, glossy brochures, agendas, conference proceedings, sales materials and technical documents, and training coursework. Our copiers also make it easy to electronically archive, share and retrieve documents. The newest copier features can improve communication between different office locations or allow you to send files to clients and customers directly from a machine. This saves your business time and money. In addition to staff time and productivity, you will notice that have a modern digital copier increases your energy efficiency as well. Reduce your carbon footprint and go with a greener technology by upgrading your equipment. Get excited about getting your company’s message out with features like sideways printing, trifold brochures, custom size paper, collating and stapling. We are the best copier company in Tempe. Arizona Copiers is an affordable choice for all your business needs in Tempe. If you are looking to rent a copier for a short period of time, ask about Tempe Copiers and our affordable rental plans. Don’t shop all over. Make just one stop in Tempe for all your copier needs. 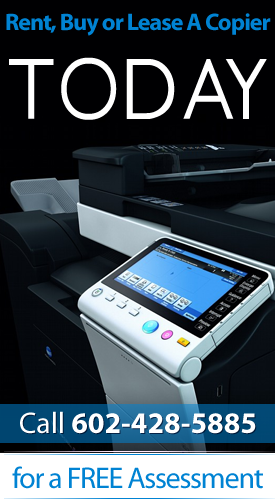 We sell a variety of Konica Minolta and Sharp copiers which fit any size office space. If you have a small business operation or a large company with multiple locations, Tempe Copiers can help you outfit your business with affordable options. Contact our customer service representatives for the fastest, most reliable copier company in Tempe. It’s easy to keep up-to-date with high-tech features like dual-side scanning, booklet design and advanced stapling. Lease a copier from us and experience world class quality and service. Get competitive and get an edge against the competition. Win the next bid your company submits because you have the most professional looking bid package. Our copier machines make glossy brochures, sharp fact sheets and high-resolution color images. Make hard copy packages or email electronic documents to beat tight deadlines. Arizona copiers has what you need to propel your business to a new level. Let our experienced sales and marketing staff assist you with making the right choice for your organization. Whether you are establishing a new location for your company or expanding to additional locations, your needs for copy machines and office equipment could be rapidly changing. Is your budget limited? Learn how to stretch your budget with a variety of purchase, lease and rental options. Don’t worry if you don’t have enough capital on hand – grow your business with our affordable financing options. Highlight key features on work plans, edit documents or mark-up hard copies of documents and fax or email them quickly to others working on the project team. Don’t sacrifice high resolution when converting documents to PDF and emailing them to clients. If you are trying to find an established copier company, we have the expertise and knowledge your business needs to succeed.